While it’s not required to use the emulator, [Brian] even went as far as recreating the handheld control unit the ENIAC operators would have used. He mentions this peripheral is often overlooked, and in his research was only able to find a single clear shot of what the device looked like for him to base his 3D printed model on. I spent a fair amount of time chatting with [Brian] about this project. I have an interest in the first generation computers and this was one of my favorite exhibits at VCF East. An ENIAC cycle accurate simulator running slower than the actual machine? I’d say this is because: 1. Lack of optimisation. 2. Choosing go as programming language. It’s beyond just cycle accurate, that’s the whole point. It is simulating the ENIAC on the electrical level. If it was just cycle accurate, it would be much faster. So, I guess is something intermediate between circuit level and cycle accuracy. I think the previous comment is more or less correct in saying that it is an electrical simulation versus a circuit simulation. Though admittedly it’s a gray area. The software simulates the electrical pulses as they would travel between components, but it doesn’t attempt to actually simulate the operation of individual transistors/tubes/etc. So it’s less abstracted than most emulators, but not as low as you could potentially go. History of the IC and computing go hand in hand. Maybe in a Fallout universe it would be the history of tubes. But it would never have led to the integration density of today’s ICs. It’s quite difficult to deposit metal layers on vacuum and structure them to metal traces. Why would metal need to be deposited on vacuum? If you want an air-bridge deposit metal on something and then etch away that something while keeping the metal. I think that, technically, that input device was really the first mouse. It looks to have all/most of the features of a modern day mouse. I had not considered how they manipulated that giant machine before seeing that controller. Interesting article. It’s neat that they actually went to the pulse level for emulation. Many people don’t realize that almost all emulators only go down to a fairly high abstract level and none actually emulate the actual physics. Very few do transistor level emulation. It’s also not immediately clear just how much actual raw computation is even needed to emulate things as “simple” as an Atari or Eniac at the circuit level, let alone actually doing a full emulation of all of the actual molecules involved. Brian has been working on this for several years. I’ve seen two iterations of it, most recently at VCFSE. He has put an incredible amount of research and work into it and spends lots of time with visitors explaining it. He is truly preserving the history of this fabulous device for future generations to understand. 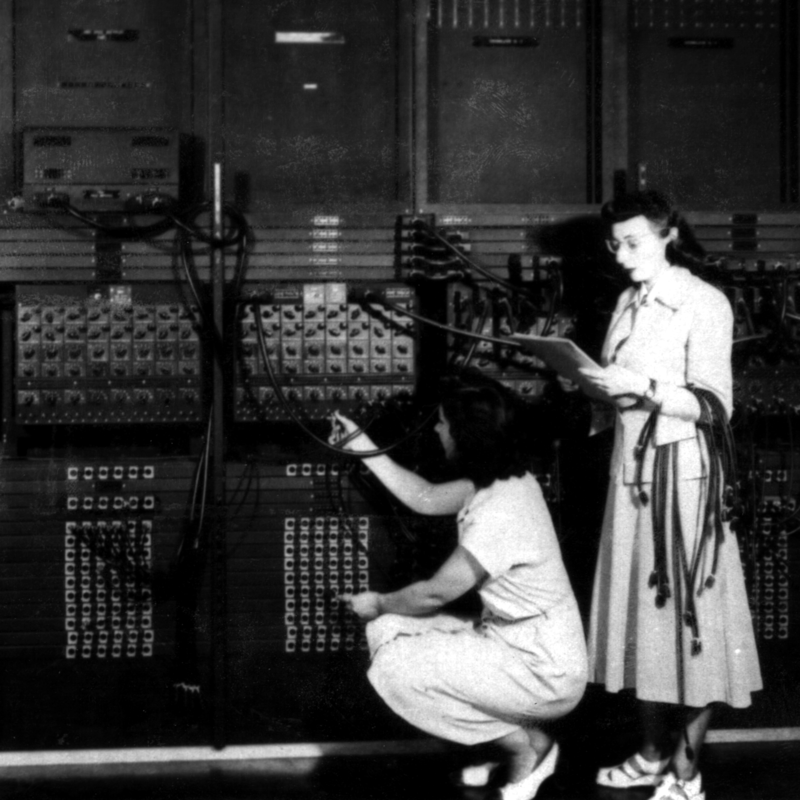 Recently I read the autobiography of Jean Jennings Bartik, one of the six programmers of the ENIAC. In the book, she talks how women where relegated to the lowest task, and if they were used as programmers was precisely because it was considered a “simple task” (at the time, it was considered that the true complexity was in designing the machine, not in programming it; this didn’t change until the Apollo Guidance Computer). I remember seeing a picture of the ENIAC when I was 10 (in the 80’s), and wondering why was there “that woman posing in front of the computer, like in a car advertisement”… Now I’m embarrassed of that, but funny enough, Jean explains in the book that it was a very common misconception, which was only fixed in the 90’s, during the 50 anniversary: until them, nearly all people that saw the pictures believed they were just “refrigerator women”, and not the real programmers. In fact, the men in the pictures were the ones “posing”. 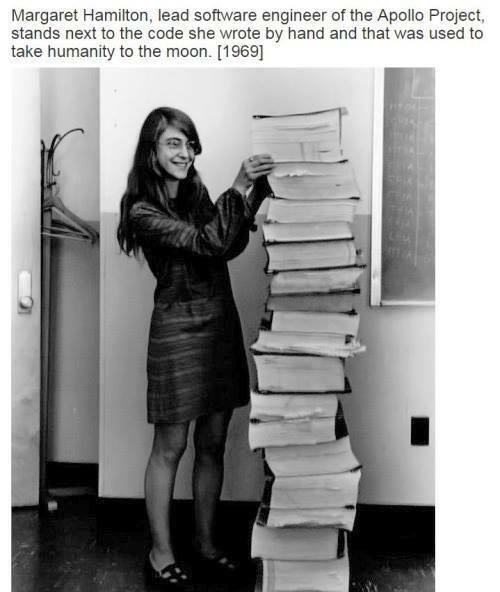 To be fair, Margaret Hamilton didn’t write *all* of that code herself. But she was the lead software engineer of the Apollo Project Guidance Computer. I love that this is a guy from Drexel making a simulation of a machine that was created just a few blocks away, at Penn. Such a Philly jawn. To make this true you only need to want software decoding of MP3 doorbell chimes. The MAS3507 is probably not available anymore. Tom? You were there? So was I. I”m surprised that the rest of the crew didn’t say anything…… And yes that was an interesting job that of emulating a computer system that basically started everything off.